A small bomb exploded near an underground train station in New York's Times Square on Monday. The explosion during rush hour injured the suspected bomber and three other people. All four were sent to the hospital for treatment. Police described the incident as an attempted terror attack. 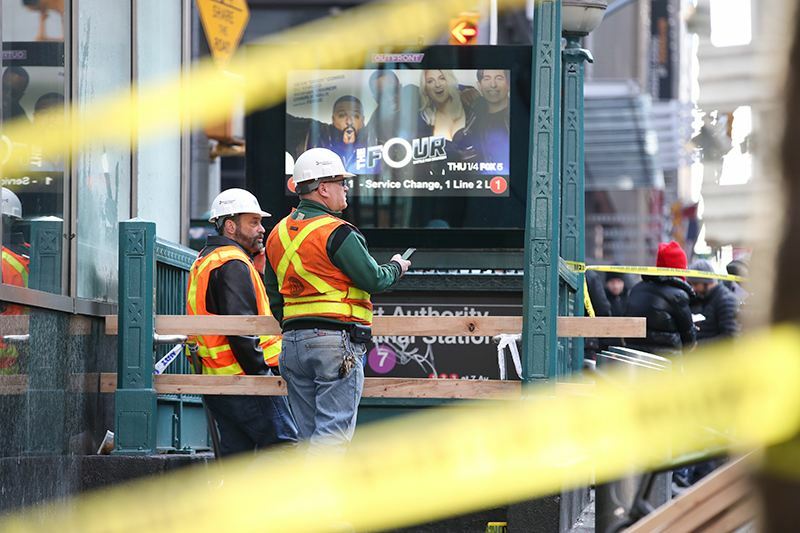 The explosion happened in an underground passageway that connects Times Square station on 42nd Street to a station under the Port Authority Bus Terminal. Many people were in the passageway when the explosion caused it to fill with smoke. New York City Mayor Bill de Blasio said, "Thank God the perpetrator did not achieve his ultimate goals." New York officials said the Islamic State terrorist group inspired the suspect but that he did not have direct contact with the group. Officials said he lives in Brooklyn and possibly was born in Bangladesh. A video from a security camera shows the suspect in the tunnel when the bomb exploded in a burst of white smoke. It shows the suspect on the ground and people fleeing the area. The New York Post newspaper published a photo of the man lying on the ground with his shirt torn off and burn marks on his body. The photograph also shows police officers holding the man's hands behind his back. The explosion at 7:30 a.m. closed the nation's busiest bus station, eight underground train lines and all the streets around Times Square. John Miles was waiting for a bus to Massachusetts. He also did not hear the explosion, but saw police react. "I didn't know what was going on. Officers were running around. I was freaking out," he said. There was an announcement that people should leave the area. On October 31, another act of terror killed eight people in New York City. The suspect in that attack drove a truck down a crowded bicycle path. Officials said the area of Monday's explosion would be re-opened by the nighttime rush hour. During the evening rush hour it was often solid with vehicles. Terror attack, a social menace of mankind, has spread and become more violent worldwide in recent years. My eyes fill with mist again. 5.New York officials said the Islamic State terrorist group inspired the suspect but that he did not have direct contact with the group. You were the last person to have contact with him. Don't you have contact with Mary? 6.The New York Post newspaper published a photo of the man lying on the ground with his shirt torn off and burn marks on his body. It was worth almost having your ear torn off.